of how our ancestors have lived. is a fun coordination developing activity which introduces many of the age old stone and wood shaping techniques used in many other technologies: drilling, grinding, polishing & oiling. Using soapstone (a soft but durable stone) we make beads to hang on the string that we have created. Participants drill holes in soapstone using a drill made of willow & bamboo, shape that stone in to a bead using abrasive stones, polish the bead with "horsetail" sticks, and oil the finished bead with fat. Everyone takes home either a bracelet or necklace which they are very proud to have made "from scratch". Large grassy field is the best venue. Oldest & most pandemic of hunting tools. In Australia, rabbitsticks evolved into the boomerang. One of the oldest most fundamental of tools. Showing how to hold the spearthrower. Enjoy a long & diverse history as the tool used worldwide to hunt mammoths, mastodons & other megafauna. 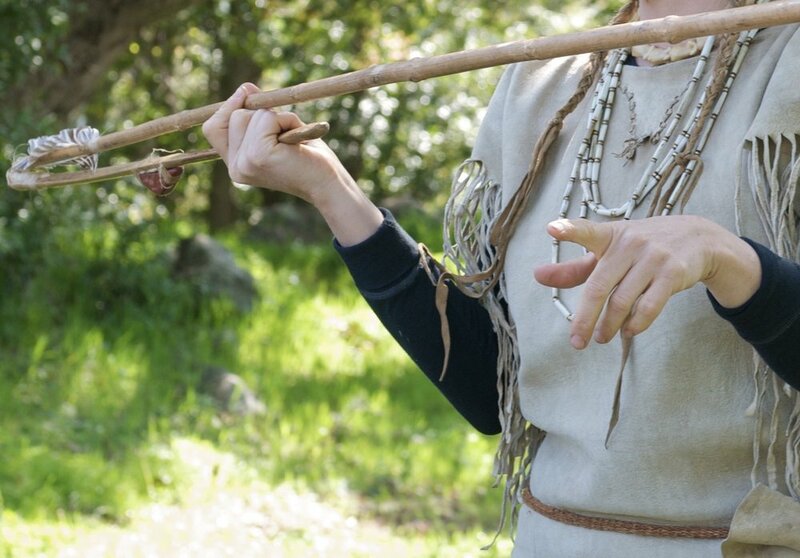 In the Old World, spearthrowers were replaced by the bow & arrow long ago, while in the New World, spear throwers reached a much higher level of design. Atlatl in motion. The dart is about to fly away from the thrower. Our low power crossbows are very popular. 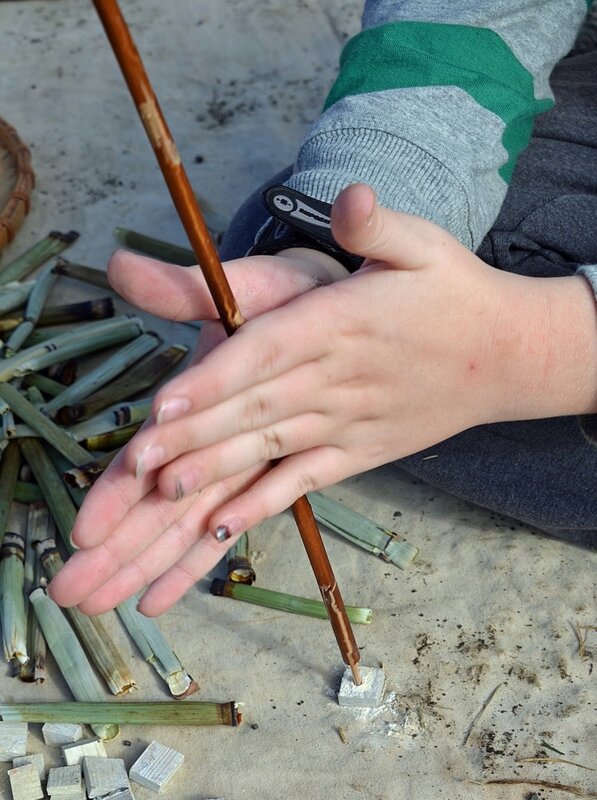 We begin by demonstrating how to make a fire by rubbing sticks together. Prepared handdrill firemaking kits are then supplied so participants can partner or group up and give it a try as an additional thing to try during their bead making activity. 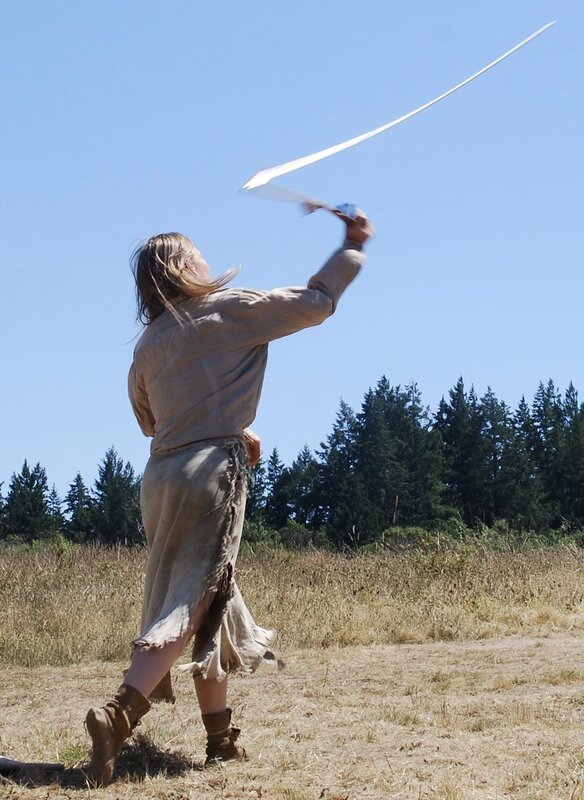 Friction fire is a difficult skill to learn, so youth programs concentrate on the process, the need to cooperate, get into a rhythm and focus each individuals’ energy. which is both empowering and exciting..
and more focus is given to actually making fire. Hoop & Pole game is a very fun and instructional spearthrowing game. Preparing to throw the atlatl. Ready to release the arrow. Probably the most familiar hunting tool. Still used in many different forms today. Using pine nuts (Pinus sabiniana) we make beads to hang on our strings to create a beautiful necklace which represents the energy and time that we have put into creating it. The process of extracting the native fiber Dogbane and/or other materials is demonstrated and can be explored further with individuals if there is adequate time & interest. We will use prepared Romanian hemp to practice string making and create our necklaces. We twist these fibers into string using a group triangle twisting method which utilizes concepts of physics & geometry and which also requires cooperation. The process of making a rope embodies a lot of cooperative energy. Three separate cords being twisted on their own and then together. Sharing our workstation with friends. Getting ready to throw handspears at rolling hoops. SUCCESS!! Three 6th graders tending the fire that they created completely on their own. The program described here is specific for school situations and dates are available in the Fall, Winter & Spring months. to find out about current available dates or with questions for more specific information concerning a custom program to fit your needs. Look at the TOPICS page for a complete description of other topics. Don't have a large enough group to sponsor a program? 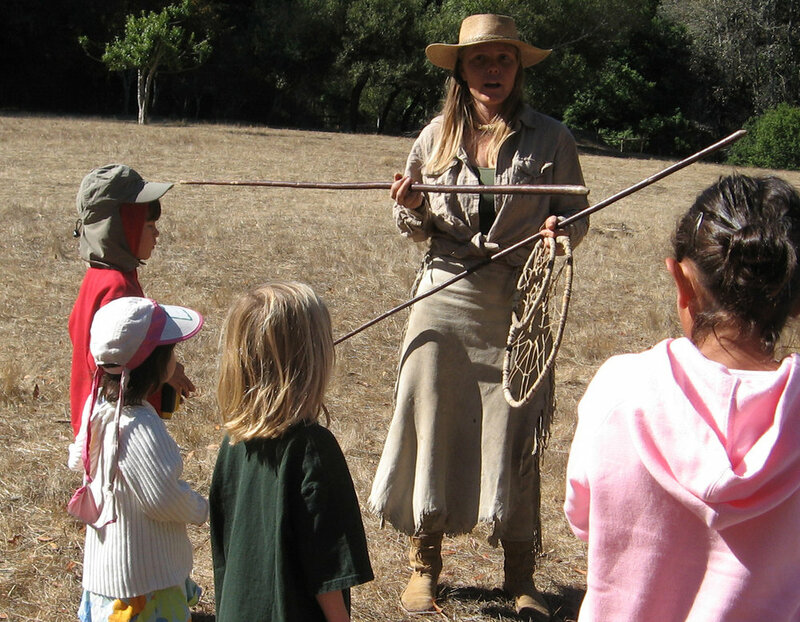 Check WORKSHOPS for upcoming family day programs open to the public. Covers hunting tools, pine nut beads, soapstone beads, stringmaking, firemaking & ropemaking. A Travel Fee may be added. Larger groups are divided into 4 groups to rotate through 4 stations. $750 for around 10-15 students, $10/student thereafter. 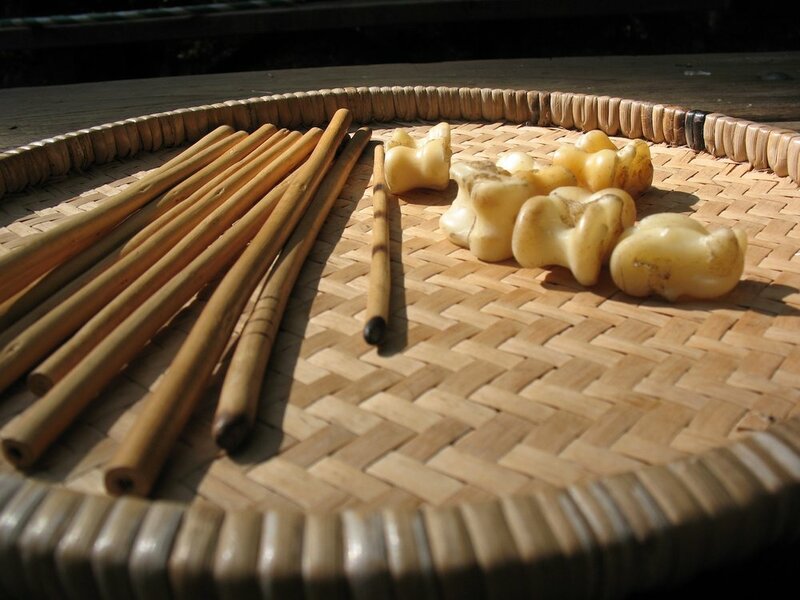 Covers hunting tools, pine nut beads, soapstone beads, stringmaking & firemaking. $750 for around 20-30 students. Usually presented as a display of samples which the students can touch, handle & ask questions about, combined with a live demonstration of the process.